Codenamed Pitch Black 2016, the biannual exercise in the first three weeks in August, saw 115 aircraft and 2,800 personnel from 10 countries participating, flying offensive and defensive counter-air missions using large force employment tactics to build interoperability in a coalition environment. Other than the United States and host Australia, Singapore, Thailand, Indonesia, Canada, and France also took part with aircraft, while New Zealand, Germany and the Netherlands sent personnel to participate. The American contingent included USAF Lockheed-Martin F-16CM fighters and Boeing B-52 bombers, along with a squadron of Marine Boeing F/A-18 Hornets and Lockheed-Martin KC-130J Hercules tankers. The USAF F-16s and 175 USAF personnel at the exercise were from the 14th Fighter Squadron, normally based at Misawa, northern Japan. The 14 F-16CMs that deployed to the exercise made history of sorts when they became the first operational F-16s to refuel from a Royal Australian Air Force (RAAF) Airbus KC-30A tanker during their trip to RAAF Base Darwin from Kadena Airbase in Okinawa, where the 14th was temporarily based while the runway in Misawa was undergoing repairs. 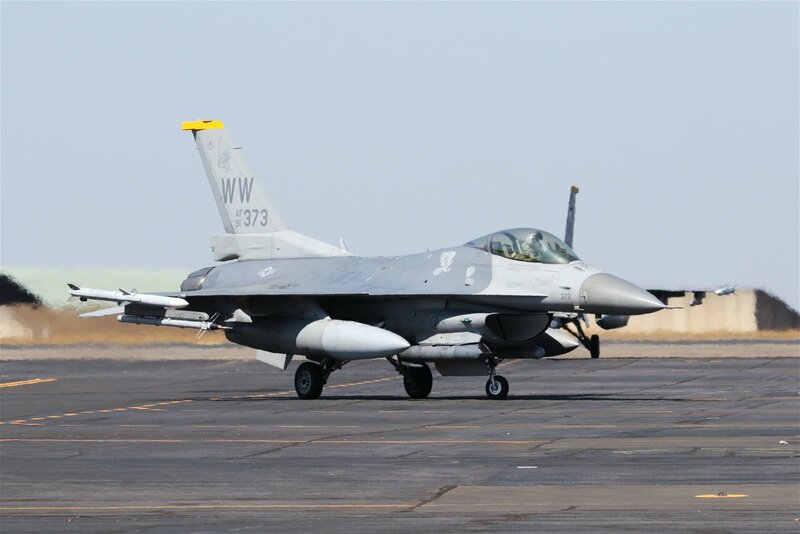 According to Lt. Col. Mark Heusinkveld, commander of the squadron, the flights from Kadena to Darwin took six hours, with five refuellings in between to ensure the F-16s had sufficient fuel at any time to reach an alternate airfield in case of an unscheduled diversion. While in Australia the 14th primarily carried out its traditional suppression of enemy air defenses (SEAD) mission when flying in the offensive counter-air role for Blue Air, utilizing simulated AGM-88 HARM anti-radiation missiles assisted by the Raytheon AN/ASQ-213A HARM Targeting System (HTS) and Lockheed-Martin Sniper Advanced Targeting Pod. A realistic ground-based threat against Blue Air was provided by a Northrop-Grumman Joint Threat Emitter (JTE) belonging to the USAF. Greg Kuntz, Northrop-Grumman’s business development manager, combat training ranges (electronic warfare) who supported the deployment of the JTE at Pitch Black, told USNI in an exclusive interview the system simulated Russian “single-digit” surface-to-air missile systems such as the SA-2, SA-3 and SA-6 at the exercise. Two Republic of Singapore Air Force Raytheon-Improved Hawk SAM systems provided an additional Red Force threat vector. The USAF F-16s also flew some defensive counter-air missions as Red Air, providing a “capable adversary” for Blue Air forces. Heusinkveld relished the ability to operate over the wide expanses of Australia’s “Top End,” noting it was rare for his unit to have such a training opportunity in the Pacific, where it can go supersonic and fly at low altitude over land with few air traffic control restrictions. Just as important was the opportunity to operate with friendly regional air forces, with Heusinkveld telling USNI that Pitch Black was a “great opportunity for us to see the capabilities of people that we don’t often get to train with.” This was true of the USAF B-52s, which were the only exercise participants based out of Australia. 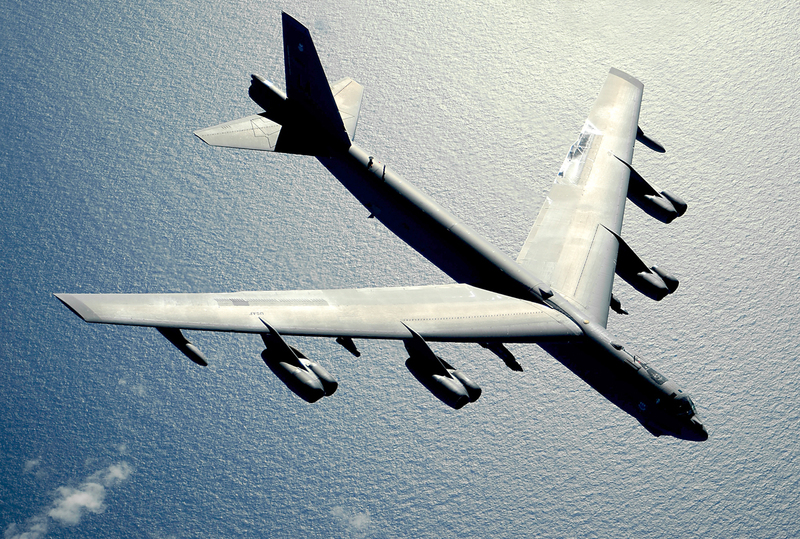 Flying from Guam, where they are deployed to as part of the USAF’s continuous bomber presence in the Pacific, the B-52s undertook simulated precision strike and close air support missions at Pitch Black, attacking targets designated by friendly forces. During a visit to the RAAF’s 114 Mobile Control Reporting Unit, which provided tactical airspace battle management and surveillance at the exercise, the author witnessed two B-52s—callsigns Havok 11 and 12—working with an RAAF IAI Heron unmanned aircraft on the radar scope spotting targets over the exercise airspace. 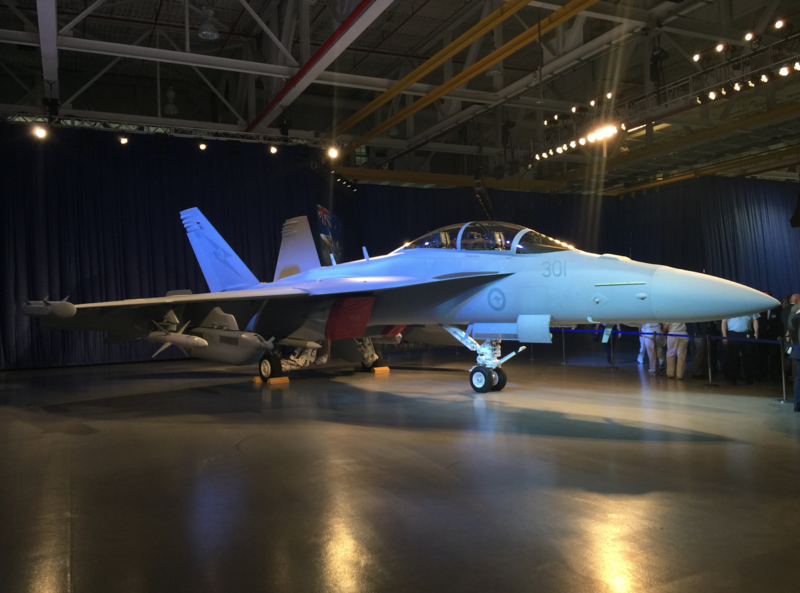 Meanwhile, Marine TACAIR assets at the exercise took the form of ten F/A-18C Hornets from the Werewolves of Marine Fighter Attack Squadron (VMFA) 122. Normally based out of Beaufort, South Carolina, the squadron has just completed a four-month unit deployment program (UDP) assignment with Marine Air Group 12 at MCAS Iwakuni, Japan, before heading Down Under. Based out of RAAF Base Tindal in Australia’s Northern Territory, VMFA-122’s Hornets took part in Pitch Black’s large-force offensive counter-air and defensive counter-air support operations throughout the exercise, with VMFA-122 commander LTCOL Derek Brannon calling the exercise a culminating event for his squadron, with lasting effects on its combat readiness. The squadron also conducted close air support, air interdiction, armed reconnaissance, and strike coordination and reconnaissance missions during Pitch Black, employing a variety of ordnance that included 500- and 1000-lb. free-fall bombs. Following Pitch Black, the Werewolves will carry out three additional weeks of unit level training, known as Southern Frontier, helping the squadron gain experience and qualifications in low altitude, air-ground, high explosive ordnance delivery at the unit level. Supporting the Werewolves Down Under were Marines of Marine Wing Support Squadron 171, Marine Aviation Logistics Squadron 12, Marine Aerial Refueler Transport Squadron (VMGR) 152 and other Marine Corps elements. The Sumos of VMGR-152 participated in Pitch Black with two KC-130Js, whose main tasking was tanking the Hornets of both VMFA-122 and the RAAF. Speaking to USNI News, VMGR-152 commander LTCOL Andrew Pushart also revealed the KC-130Js were carrying out assault landing zone training during their time in Australia, using the dirt strip in Australia’s Bradshaw Field training area to practice operating from unprepared runways. 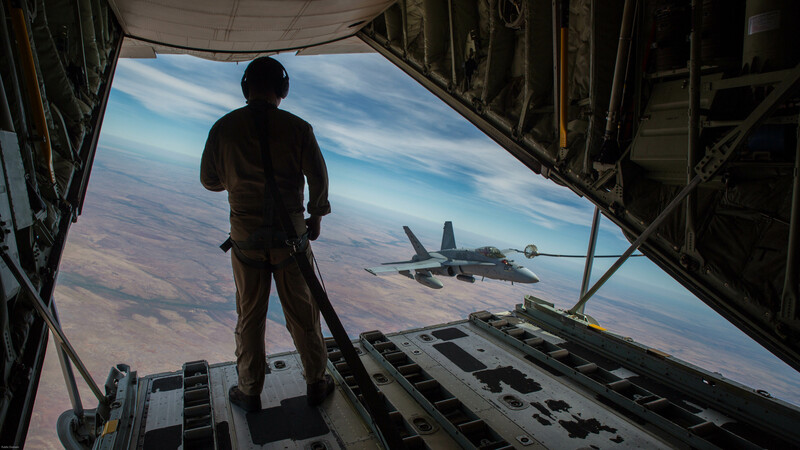 The RAAF regards Exercise Pitch Black as the premier air-combat exercise conducted on Australian soil, and with a steadily increasing level of complexity and realism over its past iterations. With the regular UDP deployment of Marine Corps Lockheed-Martin F-35 Lightning II Joint Strike Fighters to the region starting in 2017 and the annual dry season rotational deployment of Marines to the Top End due to increase to a 2,500-strong Marine Air-Ground Task Force in 2020, it is very likely that the tempo of U.S. participation at future Pitch Blacks will continue to increase.